"Wonders shall never seize to happen", so goes a popular saying and one of the latest attestations to this assertion has just been recorded in Akwa Ibom State where a young lady is said to have given birth to what? … Wait a minute … one, no… two life fishes at a time!. 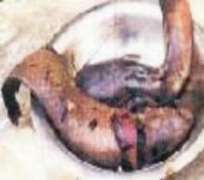 The lady, according to the report, comes from a community in Nsit Ibom Local government area of the state and had attended a revival service organized by Land of Truth Fellowship Centre known among the people as Isong Akpaniko, situated along Emco Lane in Uyo, the state capital, when the incident occurred. A petty trader by profession and simply identified as Mrs. Eyoh, the woman was said to have gone to the church with her husband where both of them usually worshipped together. She is a deaconess, while the man is an elder in the church, our source explained. We learnt that she had been under the pregnancy for at least three years and was always assured by prophesies at the church that she would have a safe delivery, regardless what the "cargo" might look like. However, an internal source at the church told us that during the revival which lasted for one week, a special group of members had intensified prayers with intermittent pronouncements pointed directly at the mysterious birth by the expectant woman. When, incidentally, the birth took place, the couple was consoled and prayed for by those who witnessed it before the news spread. The source explained that earlier at the prayer session, she indicated signs of labour and was quickly taken away into the vestry by a few women which included a prayer team. However, she finally gave birth to two lively fishes without any presumed damage or problems which sometimes accompany child delivery. A member of the church, Mr. Udeme Afia told reporters that though it was a mysterious birth, the congregation expressed joy to God for saving the life of the woman by casting out the objects through the means that pleases Him. Mr. Afia revealed that another woman had, about a week earlier, given birth to a tortoise in the same church and attributed the incidents to the powers in prayer. The founder of the church was also said to have thanked God for using him as a vessel to save people from the pains of the devil.